The tradition of celebrating our nation's veterans began with Armistice Day celebrations on November 11, 1919, marking the end of World War I and welcoming home U.S. troops. After World War II, Armistice Day was renamed Veterans Day. It was designated as a day to honor and remember veterans from all eras of American history. Although public support of veterans waned in the 1970s and 1980s due to the controversy surrounding the Vietnam War, the effort to support and celebrate our nation's veterans has been strengthened by veterans returning from the Iraq and Afghanistan conflicts spurred after the 9/11 terror attacks on the U.S. The United War Veterans Council runs the event and has announced big plans for the 100th anniversary of Armistice Day in 2019. Veteran's Day takes place on November 11 every year. So does the New York City Veteran's Day parade. Many people confuse Memorial Day and Veterans Day as both are holidays designed to honor people who have served in the U.S. military. Veterans Day is intended to celebrate living people who have served in the military, while Memorial Day is a day to honor those who have died. 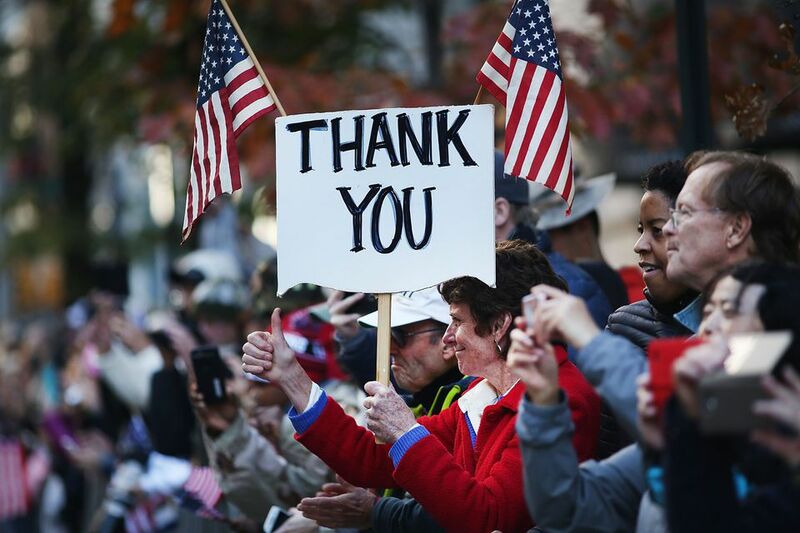 Veterans Day is a federal holiday, so banks and schools are closed, but most other businesses will be open. When the federal holiday falls on the weekend, then most schools or banks observe the holiday on the Friday before or the Monday after. For example, when November 11 falls on a Saturday, the holiday is typically observed on the Friday before and when it falls on a Sunday, it is typically observed on the Monday after. The parade takes place every year on Veteran's Day, November 11, rain or shine. It will start at 11:15 a.m. and goes on until about 3:30 p.m. The parade marches up historic Fifth Avenue from 26th to 45th Streets, past iconic landmarks such as the Empire State Building, as up to a half-million spectators cheer them on. The route is about 1.2 miles and takes approximately 30 to 35 minutes to walk. The NYC Veterans Day Parade is broadcast live on television, streamed live online around the world, and shown on Armed Forces TV. A highlights program is also shown later in the week in major cities across the U.S. This year's parade (2018) commemorates the 100th anniversary of the end of World War 1 in 1918 and features the U.S. Army, but the other four will also be participating, as always. There are a variety of marchers, floats, and marching bands in the Veterans Day Parade. Participants include active officers, various veteran's groups, junior ROTC members, and the families of veterans. The parade includes active military units from all branches, Medal of Honor recipients, veterans groups, and high school bands from around the nation. The United War Veterans Council typically names one or more grand marshals to lead the parade each year in honor of their service. The Veterans Day Parade has been organized in New York since 1929. More than 40,000 people participate in the parade each year, making it the largest in the nation. The parade is preceded by a traditional opening ceremony in Madison Square Park. A prelude featuring music and a flag presentation begins at 10 a.m.; the formal ceremony begins at 10:15 a.m. A wreath-laying ceremony occurs at the Eternal Light Monument at 11 a.m., auspiciously on the 11th hour of the 11th day of the 11th month.